EVANSTON (Feb. 11, 2019) - The temps dropped well below freezing, but that didn't stop folks from coming out for community and pizza. Sunday, February 10, Curt's donors gathered for a special appreciation event and the broader Evanston community joined the pizza party too. See more photos here. BIEN HOA, VIETNAM (Dec. 12, 2018) - Central Pizza Pie Chef Hòa Voscott traveled across the world to his native Vietnam, where he held the first ever international PopUp for Good on Sunday, December 9. Funds raised will be donated to a local Buddhist temple for rice and other food to be distributed to those in need in the region during the upcoming Tet celebration. Tet, the most celebrated holiday in Vietnam, marks the lunar new year, and in the past also marked the occasion for an informal truce in the Vietnam War between South Vietnam and North Vietnam. The $400 raised are thought to have the purchasing power in Vietnam of what $2000 would in the U.S.
PopUp for Good attendees dined on two of the Central Pizza Pie favorites, the Quattro Formaggi and the Hot Potato. Chef Hòa also created a Straw Mushroom and Pepperoni pie to capitalize on locally grown fresh produce. Assisted by family members, Shrimp scampi made with locally-fished prawns and locally-made mango and green tea iced cream were also on the menu. While he incorporated as many local ingredients as possible, the chef had traveled to Vietnam with ingredients he knew would be difficult or impossible to find. These included cheeses, pepperoni, Italian parsley, a range of other herbs and yeast. Asked how it went he said he was thrilled with the funds raised and that everyone loved the pizza and pasta. He did, however, note some technical challenges, “They don’t use ovens like we do so the oven didn’t really get hot enough. It was a bit nerve-wracking, but also kind of funny,” said Chef Hòa. “The crust was just a bit under-cooked. Still, it was crispy and light — and that’s what I care about most in my crust.” For more about Central Pizza Pie click here. Central Pizza Pie clean-up/dance party, November 11, 2018. (PopUp6). EVANSTON (Nov. 12, 2018) - For the second time Central Pizza Pie has focused its funding priorities on the Evanston-based organization Interfaith Action. Funds will support general operations for the organization as the winter season sets in and it begins to operate emergency shelter services and warming stations. Those who came out to dine and raise funds enjoyed one pizza that is new to the Central Pizza Pie repertoire, the Puttanesca which features olives, capers and anchovies. It also offered a twist on a menu mainstay; the Hot Potato became the Sweet Hot Potato, incorporating sweet potato to the caremalized onion-based pizza. Diners were also treated to two flavors of gelato, generously provided by FRIO GELATO. CURT’S CAFE STUDENTS AND WORK TO GET OUT THE VOTE SPONSORED WITH FUNDS FROM OCTOBER. Evanston (October 15, 20018) - A rousing PopUp for Good evening to support efforts to get out the vote and the ongoing work of Curt’s Café 5ook place on October 14. The event was the first fall PopUp for Good and the menu shifted toward fall with deeper, earthier flavors and included Argentine-style gelato by our friends at FRÍO GELATO. The next Central Pizza Pie PopUp for Good, to be held on November 11 (11/11) will support Interfaith Action efforts to ensure that all in Evanston have Thanksgiving dinner and will be the sixth of the PopUp for Good events that Central Pizza Pie has put on. For more about the next PopUp for Good and Central Pizza Pie visit centralpizzapie.com. Contact: Ned Schaub at hoa.ned@centralpizzapie.com or 312.533.1514. Evanston (August 16, 20018) - Thanks to all who came out to support all our neighbors that are a part of Interfaith Action programs and Curt's Café programs. Of the total $2100 that was raised $1,500 went to Interfaith Action homeless support programs and $600 to Curt's Café. A group of ten workers, including volunteers and Curt's students, served 110 diners. A record number of diners at the event tried the Evanston Egg Cream, which is an Evanston version of the famous Brooklyn-invented old-time chocolate soda. Many of those who came out to support Interfaith Action and Curt's talked about their favorite menu items. One of them, Evanston resident Mary Mumbrue, said, "Bravo. What a great evening and the pizza is off the charts." The event was the third in a Summer Series of PopUps and the last of the season. Central Pizza Pie will resume it's PopUps for Good on the second Sunday of October, which will be October 14. For more about the next PopUp for Good and Central Pizza Pie visit centralpizzapie.com. Contact: Ned Schaub at hoa.ned@centralpizzapie.com or 312.533.1514. Evanston (July 26, 20018) - Every night, people everywhere gather together over a meal, huddling around a table to share their days and experiences. It is this simple connection over food that allows people to see eye-to-eye, even if it is just for a short time. At Central Pizza Pie, Hòa Voscott and Ned Schaub use this connection to make a change in the world, gathering people around food to raise money for local nonprofits. Evanston (July 12, 20018) - Over 160 people came out in support of Evanston refugee resettlement program, First Friends, and Curt's Café, including 140 diners and 20 volunteers. Donations from diners raised $2700, $1700 of which will go to First Friends. The remaining $1000 will go to Curt's Café. Volunteers covered the full range of restaurant duties from waiter, to soda jerk, to pizza chef. Evanston-based Central Pizza Pie (CPP), started its PopUps for Good to raise funds for local nonprofits. The July 8 event brought in the largest PopUp for Good crowd and the most funds to date. Two Curt's Café North students, who were hired by CPP to work the event, ran the old-time soda fountain and waited tables. 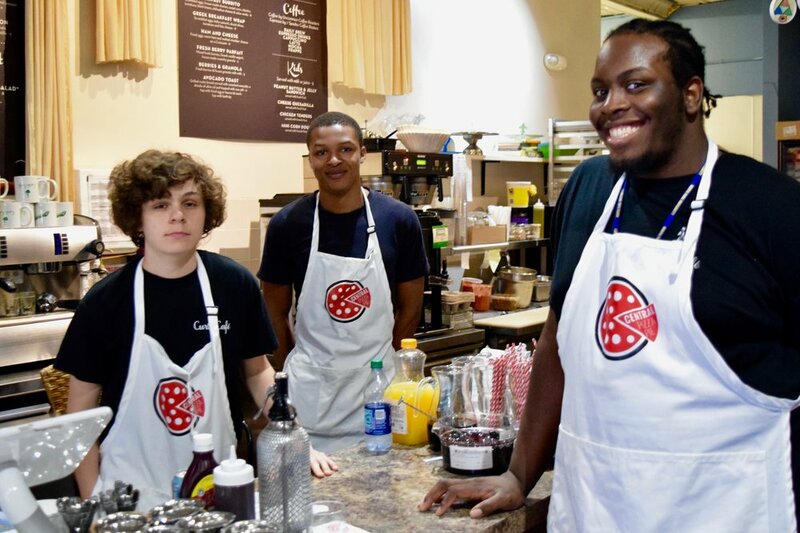 They were assisted by two volunteers, who helped make and deliver soda fountain drinks. One diner noted, "When the brownies were sold out, one of your young volunteers apologized and offered to bring us Evanston Egg Cream Sodas, explaining that they are made with chocolate. We were so impressed, and loved the Egg Creams." The event introduced two special summer-time pizzas, including the BLT and the Del Verano. The BLT is topped with applewood smoked bacon, baked and then finished with fresh tomato and lettuce. The Del Verano includes traditional Mexican ingredients, cilantro, queso fresco, corn and calabacín (summer squash), and is finished with CPP's Green Zinger sauce, which is made with citrus, cilantro and Mexican chili peppers. The event was the second in a series of Second Sunday Pop-ups, which will run through the summer, on the second Sunday of each month. The next will be Sunday, August 12 from 5:30 to 9:00pm. For more about the next PopUp for Good and Central Pizza Pie visit centralpizzapie.com. EVANSTON (June 10, 2018) - Central Pizza Pie (CPP) held it's second "Pop-Up for Good" on June 10, 2018, at Curt's Café North, on Central Street in Evanston. All profits from the event went to Curt's Café summer programs. CPP hired three students from Curt's Café North, who were joined by volunteer supporters from Evanston and Chicago. The Pop-up introduced two new pizzas, including a vegetarian pie, the June Delight, which features ricotta, zucchini and CPP's Green Zinger Sauce, and the Triple P, which is topped with pepperoni, poblanos and parmesan. New dessert items on the menu included CPP friend Barbara Waldman's double chocolate Barbara's Brownies, Lincoln Lab Shortbread -- named after the CPP founders' Labrador Retriever, Lincoln, and Homer's seasonal peach iced cream. One of the crew shows how we throw the dough! EVANSTON (Mar. 5, 2018) - Central Pizza Pie held it's first "Pop-Up for Good" on March 4, 2018, at Curt's Café. All profits from the successful event went to Curt's Café and Evanston Rebuilding Warehouse. Central Pizza Pie brings community together over great pizza! For more about Central Pizza Pie click here. We respect you and your privacy. This means we won't ever share your info with organizations, companies, or anyone else. More about the Great Central Pizza Pie Adventure soon! Copyright 2018 Central Pizza Pie™. All rights reserved.